A gluten-free replacement for when that fast-food craving hits! 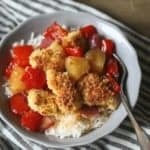 Homemade Sweet Fire Chicken is a sweet and spicy dinner treat. My family kinda loves Panda Express. Whenever they get the chance to eat there they all get the same thing, Panda Bowl with Sweet Fire Chicken and steamed rice. Panda Express as a whole is unapologetically gluten-filled. When you pull up their allergen menu, it’s actually comical. You can have… soda. Not that any fast food establishment is much better, but you know what I mean. Well I’m sure you can see where this is going… I’ve obviously made a gluten-free version. Combine some fresh ingredients, take a little help from the store, and you’re well on your way to a meal at home that is probably better than the original. The key ingredient in Sweet Fire Chicken is store-bought Thai sweet chile sauce. I’ve found several brands to choose from at the store. I don’t think any of them specifically stated “gluten-free” but the ones I personally looked at didn’t have any gluten containing ingredients. You can find it in the condiment aisle or the Asian aisle. *Just make sure to read the label! Always check to make sure you’re comfortable with the ingredients or that they haven’t changed. To get that fire you’ll also need good ole Sriracha. What I love is that this meal comes together fairly quickly. The most time consuming part is breading the chicken. First though, make some steamed rice. I use my instant pot for that. Coat with gluten-free breadcrumbs. I used Kikkoman Gluten-free Panko. I really like them because they have a lot of texture and stay really crunchy! 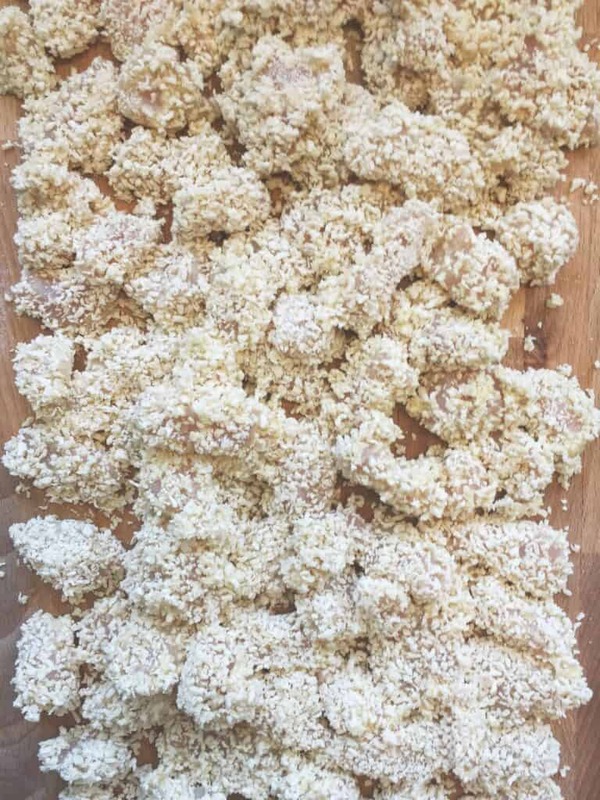 Let the coated chicken pieces rest for about 15-20 min after breading. It’s tempting to skip the resting step but it really does help the breading stick to the chicken. While the chicken rests, dice up the bell pepper and onion and drain the pineapple. To put it together, start by pan frying the chicken. Once cooked, remove the chicken from the pan and drain. Quickly sauté the onions and bell peppers in the hot pan. It’s best if they still have a little crunch. Toss in a can of drained pineapple, the sweet chile sauce, and a dash of sriracha. Stir it up. 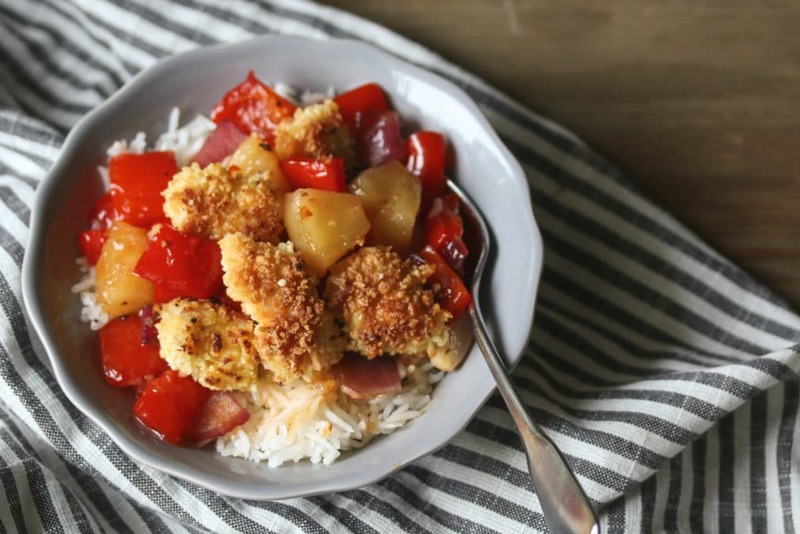 To serve, put some steamed rice in a bowl, top with the sweet-fire mixture in the pan and put some of the crunchy chicken on top. You can put the chicken in with the sauce, but we like to leave it separate so it stays crunchy. There you have it! Your very own panda bowl, right at home! The sweet and spicy favorite I copied from Panda Express, made fresh at home. 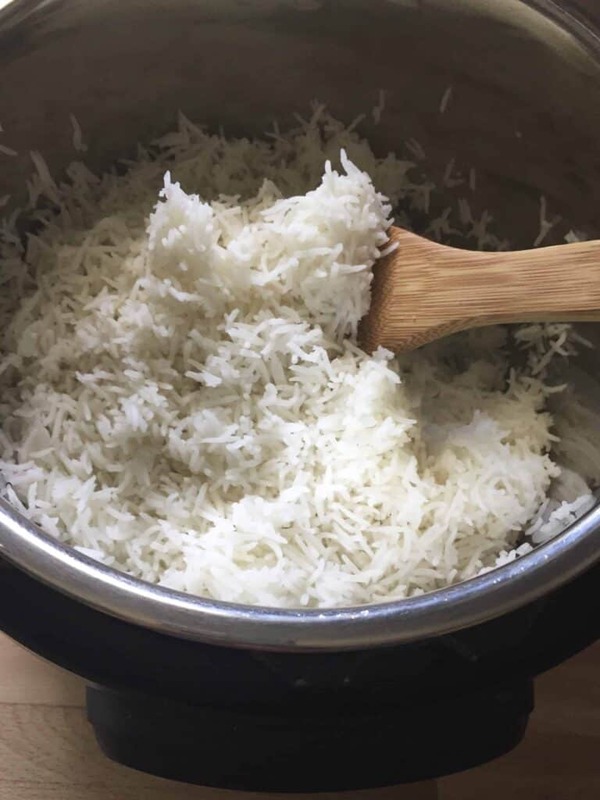 Steam the rice according to your preferred method. Align 3 bowls. Put the cornstarch/flour in one bowl, beaten eggs in the next, and lastly the breadcrumbs in the third bowl. Dredge the chicken pieces in the cornstarch/flour, toss to coat. Shake off the excess cornstarch/flour and dip the chicken into the egg. Remove each piece from the egg and let the excess egg drip off. Lastly coat each piece with the panko breadcrumbs. 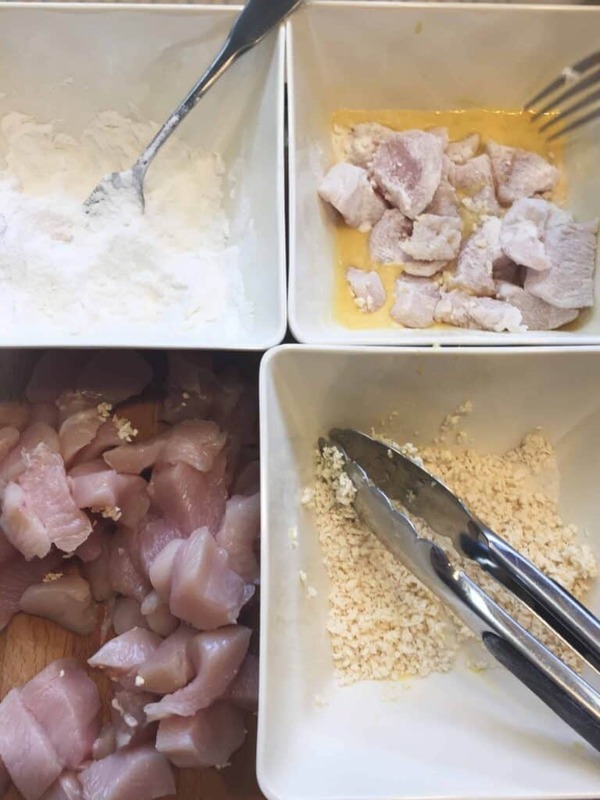 Set each piece of chicken aside and repeat until all the chicken has been coated. Let rest 15-20 min. Dice bell peppers and onion into 1-inch pieces. Drain pineapple. Set aside. Coat the bottom of a large skillet with canola oil and heat over med-high heat. When hot, fry the chicken in batches until golden brown. Add more oil as needed to cook all the chicken pieces. Remove the chicken to a paper towel lined plate to drain. After all chicken is cooked, drain excess oil if necessary, leaving about 1 tablespoon of oil in hot pan. With heat still on high, quickly saute bell peppers and onion until crisp-tender. 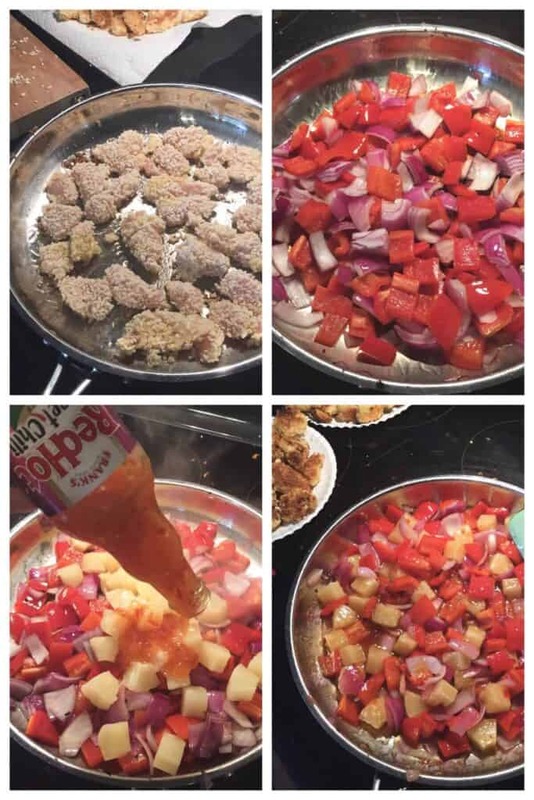 Add in the pineapple, sweet chile sauce, and sriracha. Stir to combine and allow all ingredients to heat up, about 1 minute. 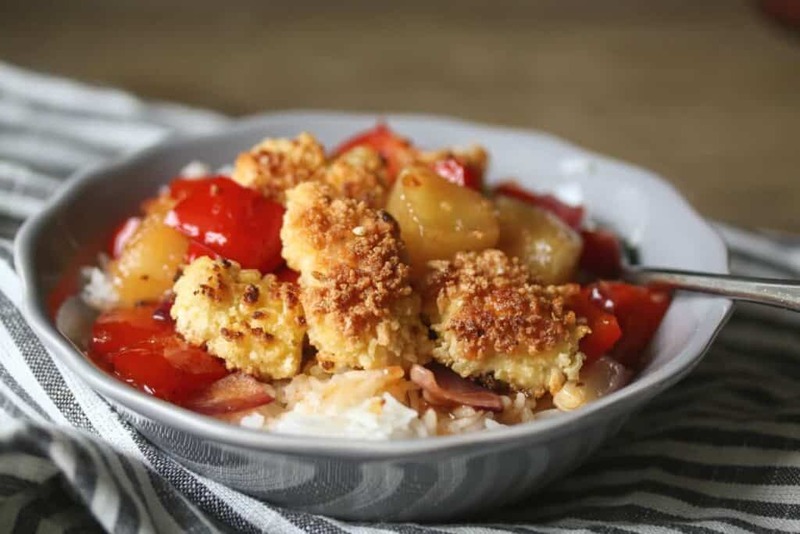 Serve immediately by placing steamed rice in a bowl, top with the sweet-fire mixture, and lastly place some chicken on top. Check out this Make Your Own Take-out meal that is on almost weekly rotation at our house.